"Your portal to everything Chessie"
ABOUT US: My name is Steve King of Hillsboro, Missouri (near St. Louis). 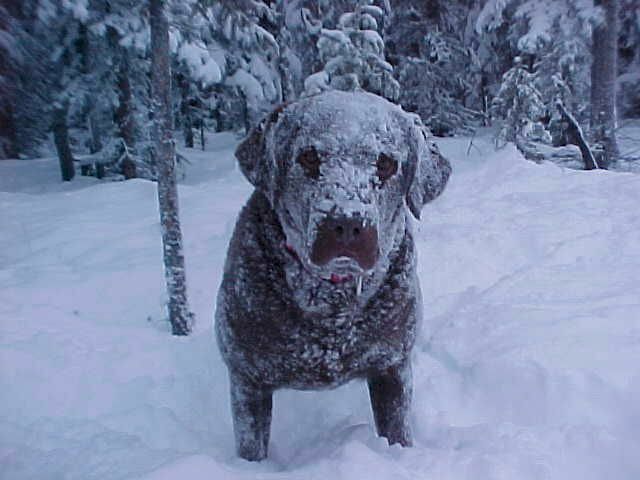 My wife and I have a 12 year old Chessie named Dakota (pictured above) that we had gotten as a pup from "Dog Gone It Acres" in Maryland (no longer in business). I, Steve, have a knack for making "fun themed" websites as a hobby and decided to turn the Chessie page that I've had as a subpage of one of my other websites into a better site. I hope it offers a good resource to all Chessie lovers. I will add to it overtime with content that may be beneficial. There are a lot of good Chessie sites and pages out there. I just hope this page to be an excellent "portal" to ALL of them, providing ease of navigation when surfing Chessie topics. To bookmark this page, click here! The Chesapeake Bay Retriever is of American breeding. The Chessie is traced back to two dogs, Sailor and Canton (thought to be Newfoundlands), rescued from a wrecked brig off the shores of Maryland in 1807. These were possibly crossed with English Otterhounds, Flat Coated Retrievers and/or Curly Coated Retrievers. No one really knows for sure which various breeds/crossbreeds figure into the origin of the Chessie. The Chessie is a strong swimmer and widely used for hunting waterfowl in America. They are the duck hunters favorite. Their coat has a thick, short, slightly wavy coat that can be brown, sedge or deadgrass in color. The Chessie has webbed feet, and yellow or Amber eyes. The Chessie is valued for its bright and happy disposition, intelligence, quiet good sense, and affectionate protective nature. Friends of Chesapeake Bay Retrievers - A Chessie web ring. Pet Finder -From the left search menu, enter your zip code, select "expanded" for the search range from the drop down menu and select "Chesapeake Bay Retriever" from the breed list. Also check the picture box to show dogs with photo's. Soon you'll see all of the Chessies lookin' for a new home. Our Chesapeake Bay Retriever Smiling Video - He is so happy when I wake up. Chesapeake Bay Retriever Photo Link #12 - Via webshots. Dogster - Here you can search for Chesapeake Bay Retriever's that have their own doggie webpage with photos. Great concept!. Make sure you select "Purebred" after selecting your breed from the drop down menu. Also, sort by 20 thumbs per page for quicker viewing. Brown Dog Chessie Message Board - Must register for free, but well worth it! CBRS4ME Main Message Board - Subcategories below. Ultimate Chessie Breeders Directory - Nicely organized! Chessie Proven Tuff Extreme Kong Toy - These "black kong dog toys" are the ONLY dog toys that passed the lengthy chewing tests of our Chessie. As we all know, Chesapeake Bay Retriever's are very strong and aggressive chewers! They are still 100% intact to this day and he loves them. Be sure to get the black series and not the red series. The black ones are tougher. We HIGHLY RECOMMEND these for your Chessie! Sound That Drives My Chessie Crazy - Recently I clicked on this sound video and my Chessie went crazy. Maybe your Chessie will do the same if he/she likes squeeky toys. See Chessie owner comments here. Human Foods & Products Poisonous or Bad for Dogs - Concise listing. Chessie Pups For Sale Sign - Cute way to display your new litter. So You Wanna Breed Your Chessie? So Your New Chessie Pup Needs A Name? - Lots of name ideas here! Chesapeake Bay Retriever Security Yard Sign - Make it clear! Another style HERE. Plants That Can be Poisonous For Your Chessie - In cooperation with the ASPCA. Good, Wholesome, Quality Chesapeake Bay Retriever Dog Food - Healthy, gourmet dog food with 30 years of experience. Is Your Dog Suffering from Pain? Or stiffness, immobility or poor quality of life? Visit DogsHealth.com to help your dog live a happier life! Chesapeake Bay Retriever Memorial Yard Stake - Personalized grave marker sign. Chesapeake Bay Retriever Memorial Markers - Personalized grave marker headstone. Custom Chesapeake Bay Retriever Grave Stone - Personalized grave granite marker.